OKLAHOMA CITY, Oklahoma, April 15, 2012 (ENS) – Three children and two men have died and 10 others were critically injured in tornados that struck Woodward, Oklahoma on Saturday night and early Sunday. The Oklahoma deaths and injuries were the result of more than 120 tornados, heavy rain, large hail and damaging winds that swept across the Central and Southern Plains, impacting Oklahoma, Kansas, Nebraska, and Iowa. Power lines and trees are down across the region and thousands have been left without power. Oklahoma Governor Mary Fallin today declared a state of emergency for 12 Oklahoma counties. State agencies can make emergency purchases to expedite the delivery of resources to stricken jurisdictions. The declaration marks a first step toward seeking federal assistance should it be necessary. Rick Smith, a meteorologist at the National Weather Service in Norman, Oklahoma said the deadly Woodward tornado has been preliminarily rated an EF-2 with sustained winds between 111 and 135 mph. Cleanup and damage assessments continue in the hardest hit areas, including Woodward where a large tornado caused extensive damage to homes and businesses as well as the five fatalities. Woodward, population 12,050, is the largest city in a nine-county area. Kansas Governor Sam Brownback declared a state of emergency early today after 74 tornados struck the state. No deaths but several injuries were reported. Major damage was reported in the cities of Wichita, Kiowa and Conway Springs. Hangars were damaged at the Wichita Mid-Continental Airport and two mobile home parks were damaged. Homes were destroyed in Conway and inmates were transferred from the Rice County jail, which sustained tornado damage. Given the number of tornadoes that touched down across the state, Brownback said the state was fortunate because residents responded to emergency warnings. “People paid attention to the advance warnings issued by the National Weather Service and our Emergency Management and took them seriously. They did everything they could to protect themselves and their families. These actions may have saved many lives,” said Brownback, who toured parts of tornado-stricken areas in Sedgwick County this afternoon. In Iowa, three tornados touched down, damaging the Greater Regional Medical Center in Creston and forcing the evacuation of 24 patients. No fatalities were reported. Southwest Iowa Community College and surrounding neighborhoods were also damaged. The city of Thurman, Iowa, population 236, was 75 percent damaged by one of the tornados. Iowa Governor Terry Branstad has declared a state of emergency for two counties and toured the stricken locations this afternoon. 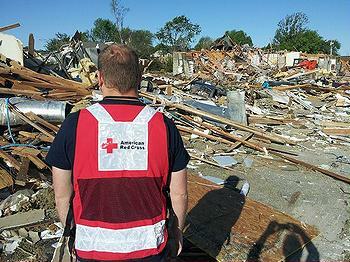 The American Red Cross is responding across the Midwest, operating shelters and providing meals. The National Weather Service Storm Prediction Center is forecasting the development of severe thunderstorms and tornados over parts of the Upper Mississippi River Valley this afternoon. Northeast Iowa, southeast Minnesota and much of western/central Wisconsin are the main areas of concern this evening.